Anyone who has delved into the world of Google Analytics will probably have come across the phrase 'bounce rate'. This, in basic terms, is the number of people who visit your web site and then disappear again, after only viewing one page. A high bounce rate is a bad sign that something is wrong with your web site or search engine optimisation because visitors who are not interested in your web site are finding it. As an example, we've been doing some SEO work on an electrician's web site recently. We noticed that they had a higher bounce rate than we would have liked and after some digging, we found that they were appearing in local search results for search terms such as 'laundry near me' and 'self service laundry'. The reason was that the electrician had written a blog post about how they had refitted the wiring in a local laundry after a fire in the building. This article being on their site meant that the electrician's web site was appearing in the number one search result position for laundries in their area. Partly because of the site being so well respected in Google's eyes and because laundries tend not to have their own web sites, meant that the wrong site was appearing high in the search results. Lots of people who were looking for a laundry were going to the electrician's web site. They then realised it was not the site that they were looking for and left immediately which caused the bounce rate to jump up. We rewrote the blog article so that references to the local laundry were minimised so that the site was no longer going to be ranked for useless search terms. This meant that fewer people were finding the electrician's site when looking for a laundry and of course this bought the bounce rate down. A good way of tracking down who is visiting your web site and where from is Google Analytics but in this case, Google Webmaster Tools gives a better idea of what the problem could be. If you haven't registered your web site with Google Webmaster Tools, I would strongly recommend it. 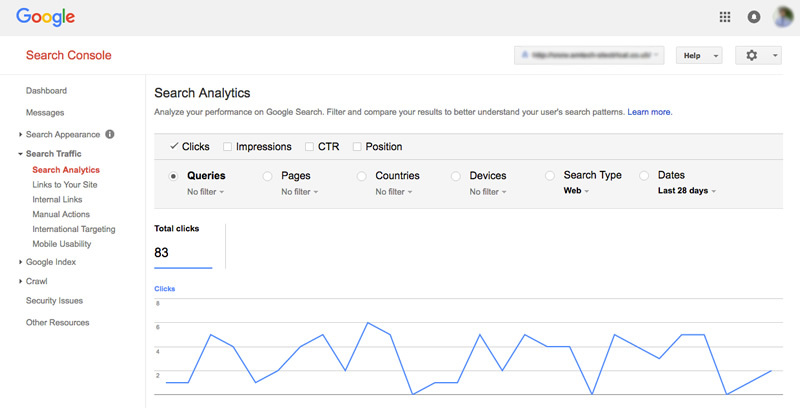 Once set up, go into the WMT account and click on 'Search Traffic' and then 'Search Analytics'. This is a great page, full of useful information to help you see which keywords your site is being found under. When the page loads, scroll through all of the results and make sure that they make sense. If any keywords look out of place (such as 'local laundry' if you are in fact a local electrician) then do some digging to find out why this is the case. Like with most things that are SEO related, it's unlikely that this tool will give you the complete picture but it will at least give you somewhere to start and help you identify any issues and bounce rate is an important one. The lower your site's bounce rate, the more accurate your search engine optimisation is. People are finding your site because it is appearing in the search results page of Google and other search engines when they type in relevant keywords. This means that your site contains information that is relevant to the users finding you. If the content isn't relevant and people are leaving immediately, something is wrong.